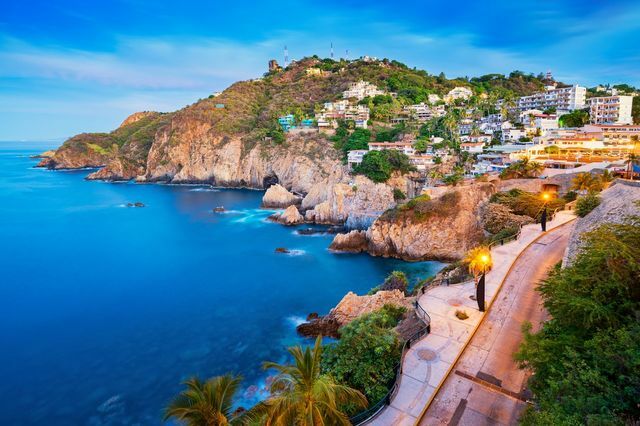 Mexico’s oldest resort town, an Acapulco honeymoon is ideal for those couples who are looking for a beach destination with plenty of opportunities to party all night long. Acapulco is a resort town set on a large bay on Mexico’s Pacific coast—and Acapulco honeymoons are super-popular. The sandy beach is lined with high-rises and the city has the Sierra Madre del Sur mountains as its backdrop. The city was Mexico’s first resort city and as such was made famous as a destination for Hollywood elite in the 50s. Today the area is a bit overdeveloped but is still sought out by scores of visitors for its high-energy nightlife, beaches and golf. Acapulco has a well-developed tourist infrastructure with hotels for every budget, a range of delicious restaurant options and plenty of raucous clubs. You’ll also find ample opportunities to enjoy the natural surroundings with tropical beaches for every taste, jungle-green hills, and mountains surrounding the city. Whether you're looking for relaxation or all-night partying, an Acapulco honeymoon is ideal for any couple. April, May and November are the best times for Acapulco honeymoons as you will find warm, sunny weather and great deals on hotels. The weather is dry from November - May and rainy from June to September. Fort of San Diego 17th century fort built in the shape of a pentagon which houses a museum related to the fort’s role in the military. Zocalo Square Acapulco’s old town square which is lined with local shops and a number of cafes. Casa de los Vientos - Mural de Diego Rivera The former studio of artist Diego Rivera which features several of his murals on the outside—ideal for art lovers' Acapulco honeymoons. La Quebrada High cliffs on the seaside that are famous for their cliff-diving shows which have been going on since the 1930s. Roll Acapulco A well-known water park with swimming pools, numerous water slides and dolphin shows. Playa Condesa A popular beach with stunning views of the sunset and a must-visit during an Acapulco honeymoon. Located nearby many popular Acapulco resorts, bars, restaurants and clubs. Isla El Morro A small, rocky island just off the coast of Playa Condesa with a staircase leading to the islands high point. Disco Beach A rowdy beach in the Hotel Zone that is popular with younger visitors and is lined with a number of night clubs. Jardin Botanico de Acapulco A world-class botanical garden in a tranquil location with a self-guided tour available in English. Our Lady of Solitude Cathedral The city’s main Catholic cathedral is an architecturally interesting building located in the city center. Any recommendations on all inclusive adult only resorts in Mexico? Are Resorts in Mexico Safe?